Date posted: October 1, 2014 by: JasonDarkX2 Category: Gaming Reviews no comment. Payday 2 hotline Miami released on September 30, 2014 is the ninth payday 2 DLC and the third paid DLC heist. Once again, the dentist returns with a new job for the gang. This time featuring a two-day heist, tasking you and your crew with sabotage and hit mission to eliminate the district Attorney Commissar and be one-step closer to freeing an old crew member Old Hoxton from prison. Well is it worth the $6.99 USD that it’s priced at? So what do you actually get this DLC pack is 1 heist, 3 Sub-machine guns, 4 melee weapons, 4 masks, 4 materials, 4 patterns, and 7 new achievements. As an added bonus if you own Hotline Miami on Steam you, get an extra set of four masks, materials, patterns, and one extra melee weapon. Seriously, a good slew of content if you don’t already own Hotline Miami on Steam. The heist itself is good even though it can’t be stealthy, it combines all elements of previous heists nicely into one compact destructive loud heist. Day one of the heists features cooking meth that is optional, burning cars, blowing up a gas station, killing Russian mobsters, looting bags of meth, money and/or weapons. All in one day, seriously fighting massive waves of cops on high difficulty in a motel while trying to cook meth and doing the objective with three other people is some chaotic fun. The second day of the heist is simply finding your way to the top of the building, fight through intense waves of cop waves in tight space as the drill works then kill Commissar then wait for extraction that is pretty much it. The entire heist itself is fast paced with simple objectives and the only really down time is waiting for drills/truck to open doors, and a bar code scanner. Essentially Hotline Miami heist isn’t actually heist, but really good action fast paced Payday 2 loud missions in my opinions. If you’re looking for a reason to fight massive waves of cops getting the chance to take on every known enemy class in payday 2 with a good end heist pay out. Hotline Miami will probably be the best paid DLC that has everything going for it if you like going loud. The guns and melee weapons bundle are based on hotline Miami game making them look good standing out from other weapons. However, seriously killer looking sub machine guns with surprisingly good sets of stats. While melee stuff is the usual melee weapons but the axe and machete take it home with a high to massive damage stats at the cost of slow or fast melee attacks. Making perfect choices for going up close and personal when the heats on. The Uzi is good for packing a punch with the highest base damage of the three and similar to the spec Ops and Swedish K but at a loss of fire rate. No worries the Cobra packs a hefty 1K fire rate but with its tiny magazine size means constant reloading and the low accuracy and damage doesn’t help. Lastly the Blaster 9mm is probably the best out of the three, making one of the most viable sub machine guns. As for the other content masks and materials themselves. Unlocking them through achievements gets you iconic hotline Miami characters masks making them the masks that stands out more oppose from the other masks. By owning hot line Miami on steam gets you four extra masks which I only found don Juan (horse) and tony ( tiger ) of the four to be more worth it as extra in my opinion because they look good even without customizing. Unless you want the rooster one which doesn’t come in white as default. The materials and patterns in this pack are a bit harder to combine to make something look good. Chrome scape and Hatred materials are a good set of materials. 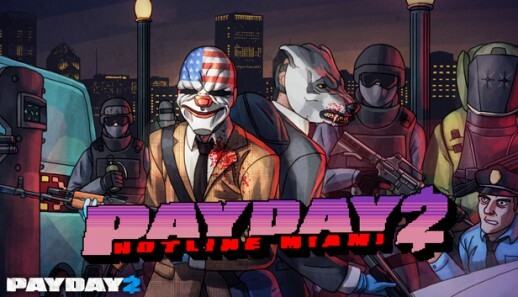 Overall Payday 2 hotline Miami DLC pack at the end of the day is all about the heist or should I say two day assassination heist that makes use of almost every element of payday 2 into a single very intense loud missions having you kill mobsters, cops, drilling doors, and looting weapons, coke, and money. The Hotline Miami inspired contents are an added bonus for Hotline Miami players. Being the second best paid payday 2 dlc heist in my opinions, I’ll no doubtedly recommend picking this pack up if you want host a couple loud heist/missions on overkill with strangers and/or friends that has a good payout. Payday 2 Hotline Miami DLC pack final verdict 8.2/10 for this seriously action pack heist/mission. get to shoot Russian mobsters. Good end mission payout of cash and XP. best Paid DLC mission played on overkill difficulty. After Big Bank. Not long enough. One more day of total destruction would've been nice. No stealth option for stealth players you're out of luck, going loud is just as fun. remember to bring some armor. Okay mask material and paterns.